CONDUCT SECURE VOICE OVER IP CALLS! The CryptoPhone 400 gives you the flexibility to conduct secure voice over IP calls using either GSM, 3G/UMTS, or wireless local area networks. 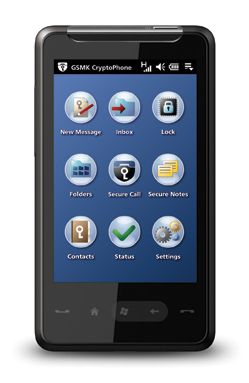 This unmatched flexibility combined with secure messaging, a hardened operating system and encrypted storage for your confidential contacts, messages and notes provides you with 360-degree protection in a sleek, elegant package including a brillant 3.2-inch TFT LCD high-resolution touch screen. 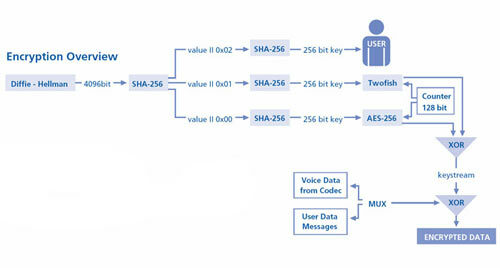 Based on the same strong encryption algorithms used for GSMK CryptoPhone voice encryption - 4096 bit Diffie-Hellman initial key exchange, AES256 and Twofish message encryption with 256 bit effective key length. Supports long SMS and encrypted self-destructing "Eyes Only" SMS. - hardened WM 6.5 operating system with granular security management and streamlined, security optimized components and communication stacks protects device against outside attacks GSMK. CryptoPhones are the only secure cell phones on the market with full source code published for independent security assessments. They contain no proprietary or secret encryption, no backdoors, no key-escrow, no centralized or operator-owned key generation, and require no key registration. Please come to visit us at ACA 2016 Winter Conference in New Orleans, Louisiana, January 22 - 27, 2016, booth 505.